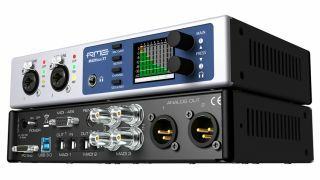 RME's MADiface XT is stuffed with connectivity options. MUSIKMESSE 2013: RME has introduced the MADiface XT, which it claims is "the world's first USB 3.0 audio interface". This sports not only three MADI inputs/outputs with 64 channels each, but also two mic/line inputs, two XLR line and one stereo headphones output. There's also AES/EBU I/O, giving you a total of 196 audio inputs and 198 audio outputs. MIDI ports are supplied via USB, MADI and DIN connections. The MADiface XT operates over PCI Express and USB 3.0 and can be used completely standalone as well as hooked up to a computer. We don't yet have price details or a release date.